When doing so, a single day's shift equals two days' worth of work, after which there is a guaranteed day off. 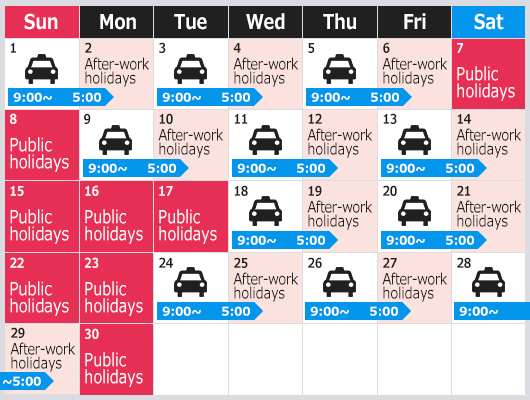 It may seem that the irregular schedule would be great physical burden, but since work hours are strictly legislated, combining breaks with public holidays results in more than half of the month off. This allows you plenty of private time for hobbies, time with family, and for relaxation. Once you arrive, a roll-call, alcohol check and vehicle checks are conducted. To ensure a safe working day, the morning inspection is conducted carefully before leaving the storehouse. Once the inspections are complete, you leave the storehouse. In the morning, you mainly target businessmen going to work, elderly people visiting the hospital, and housewives going shopping. After it calms down a bit, it is lunch time. You can take your break wherever you prefer. If your home is near, you can even rest there. In the afternoon, your targets are elderly people returning from the hospital, housewives returning from shopping, and businessmen returning from works out of the office. Before becoming seriously busy, you take your dinner break to prepare for evening operations. Your targets are those returning home from companies, those leaving for nighttime jobs, and those returning home from shopping districts. To ensure safe driving, it is very important to fully rest. You should take breaks and naps to refresh yourself, and avoid working too hard. The period when trains, buses and other means of public transportation are not running is when taxis flourish. Earnings during this period have a great impact on a day's proceeds. Completing a day of work means a holiday the following day. One merit is the ability to spend a lot of time on yourself! In order to begin work as a taxi driver, you must acquire an " class 2 driver’s license" and pass a "geography examination." First, you must undergo training to passing these tests and learn the basics of taxis. Even though the geography examination is said to be difficult, we still have an extremely high passing rate of over 90%. We possess the know-how of a large-scale ‘km group’, so we enable even foreigners to pass it easily. Furthermore, taxis are a customer service business, so you can learn everything about taxi manners and hospitality services from specialized teachers. In order to acquire the 2nd class license, you can learn driving skills by attending training centers affiliated with the km Group. The training centers feature excellent instructors with abundant experience, so even those without confidence in their driving skills can participate with confidence. Acquiring a 2nd class license requires higher driving skills than an ordinary license, but you can receive easy-to-understand and attentive instruction to help you drive quickly, safely, and carefully. After passing the 2nd class license and geography examinations and acquiring the information required for operating a taxi in Tokyo, you can finally start work as a driver. The first day you will ride along with a team leader. Later, you will ride alone, but you will give reports on the days driving details and receive feedback from team leaders and senior drivers, which you can utilize in future work. There are also many follow-up sessions after you start, such as learning seminars and driver information exchanges, so you can drive with peace of mind. A 300,000 yen monthly wage is guaranteed for the first 6 months. This is a worthwhile wage system in which your wages reflect how hard you try. For the first 6 months of driving, there is a fixed guaranteed wage regardless of sales, so even beginners can have peace of mind. Permanent residents – applicable persons: Persons granted permanent residence by the Ministry of Justice, spouse or child of Japanese person, spouse or child of permanent resident, spouse or child of special permanent resident, etc. Long-term resident – applicable persons: 2nd or 3rd generation person of Japanese decent and their family, spouse of Japanese war orphans left in China and their relatives, certain foreigners who have separated or widowed from their Japanese spouse, spouse of long-term resident, etc. Persons with an overseas vehicle driver’s license for at least three years should consult with us as in some cases the license can be switched over to a Japanese license while maintaining the license acquisition period. Persons with the Japanese language ability necessary to service customers at a normal level. Sufficient if the person has Japanese language ability suitable for everyday communication in Japan. We are now actively hiring taxi drivers.